This recipe was inspired by a friend on facebook. Thanks Denise! Cook on high for 5 hours. Mom's of little ones be careful with the chicken bones. This was so good. It fell right off the bone. And like with any crock pot recipe you can add as many vegetables as you like or you can do less. Looks yummy. Too bad I have a severely picky husband and son. My daughter and I would like it though ;-)! This sounds great - I almost passed it by til I saw the rosemary - I LOVE rosemary with chicken!! That looks really good! 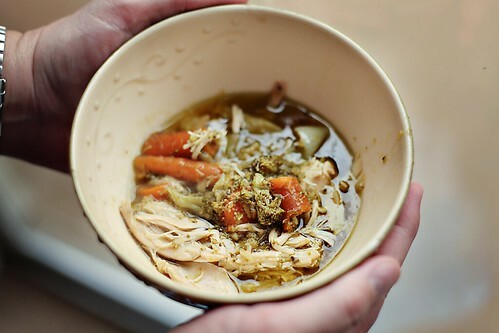 Crock pot chicken soup!